Following the first domestic /ted-2-trailer/Ted 2 trailer released back in January, Universal Pictures has released a new red band trailer and a poster for the comedy sequel, which is just as outlandish and R-rated as you may expect. There is plenty of adult language in this three-minute trailer, which should only be watched by viewers over the age of 18. However, if you are of age, then you may get a kick out of the antics of this foul-mouthed teddy bear (voiced by Seth MacFarlane) and his longtime friend John Bennett (Mark Wahlberg), especially the opening moments, where Ted and John offer their own unique version of the Law & Order theme song. The story centers on Ted as he tells John that he's trying to have a baby with his wife Tammy Lynn (Jessica Barth). While Ted tries to find the right sperm donor (including New England Patriots quarterback Tom Brady), he has hit a legal snag, with the state of Massachusetts stating that Ted has to prove he is an actual person in a court of law. We also meet Ted and John's new lawyer Samantha Jackson (Amanda Seyfried), who shares the same "hobbies" as both Ted and John. Seth MacFarlane returns as writer, director and voice star of Ted 2, Universal and Media Rights Capital's follow-up to the highest-grossing original R-rated comedy of all time. Joined once again by star Mark Wahlberg and fellow Ted writers Alec Sulkin & Wellesley Wild, MacFarlane produces the live action/CG-animated comedy alongside Bluegrass Films' Scott Stuber, as well as John Jacobs and Jason Clark. 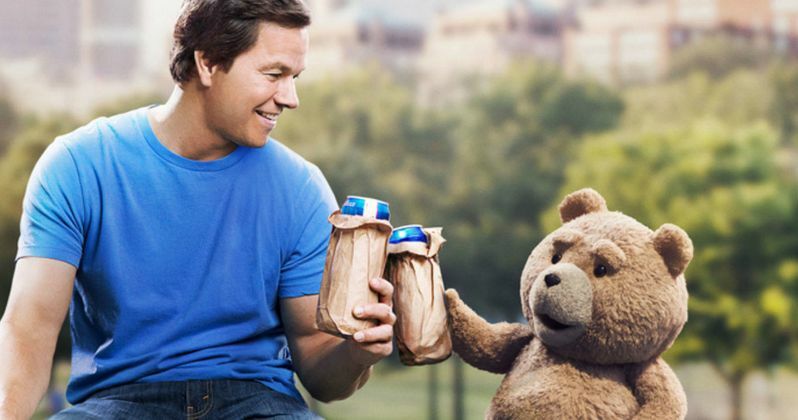 Take a look at the new footage and one-sheet from Ted 2, which hits theaters nationwide June 26.